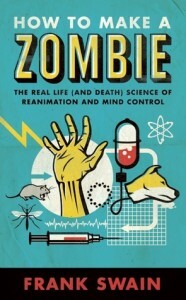 How to Make a Zombie: The Real Life (and Death) Science of Reanimation and Mind Control by Frank Swain. 2013. 256 pp. Oneworld Publications. ISBN 978-1-85168-944-6. If the concept of population dynamics has taught us anything it is that whenever a population expands far beyond an ecosystem’s ability to sustain it there will be an inevitable, and all to dramatic decline. This crash allow the population’s to once again fall below its carrying capacity, in an attempt to prevent widespread ecological upset. To be frank, humans have had to too good for too long and at great cost to almost everything else on the planet. But what will be the downfall of the naked ape? What will take us down the required notches to bring us back into balance with nature? Will it be something ecologically normal, such as mass starvation events, epidemic diseases, or a novel predator? Not likely, we have a tendency to think our way out of those scenarios. Certainly we cannot count on a sudden burst of widespread volcanoes or a massive meteor strike… lazy rocks (shakes fist at nearest stone). Then how? What will be the mechanism for the thinning of our 7 billion strong herd. Well if you are the type of scientist that regularly sets some time aside to ponder the quagmire that is the global human population crisis, often while blaring album after album of progressive rock, you have probably come to the same solution that Frank Swain sets out to devise. That’s right, as your mind walked in the court of the Crimson King you thought, someone should just release a horde of zombies… the population will recover, it will be thinned, but we can recover. The question is, how do you make a zombie? Surely that idea of the mindless undead is simply an article of fiction. Or is it? Where did the idea arise? Is it just superstition, or is there a biological grounding? Have humans already created such abomination? And if not, has nature created the blueprint for us with other species? These are the topics found within Mr. Swains “How to Make a Zombie”. I must admit I did find the first half of the book a little cheesy in its humour, however the scientific history of humanity’s search to re-spark life into long dead flesh was quite interesting. It seems we have been searching for zombies for quite some time, and the results have yielded a host on interesting avenues of research. As one may expect from a zoologist, I found the chapters focused on wildlife the most enjoyable, with Swain describing how a host of organism may have already mastered the means to create zombies for their own gains. If you were afraid of wasp before, you have no idea how right you were to fear them; but also how awesome wasp really are. Whether triggered by parasites, ethnobotany, neurochemistry, electrical implants, or good old fashion voodoo, biologist cannot help but appreciate the variety of approaches used in the attempts to re-wake the dead or create mindless automatons. The anecdotes and far reaching laboratory tales spun in this book not only give us a look into the science fiction of zombies, but also the science history of reanimation research, not to mention Mother Nature’s preexisting solutions. This certainly is an enjoyable book, for light reading when the analytical sections of your brain needs a rest. However I do caution you, before attempting to wake the undead, in of course the noblest attempt to bring the human population back into balance, you take the time to read both Max Brooks’ “Zombie Survival Guide” and “World War Z” (not to be confused with the movie of the same name but with a completely different plot… damn you Brad Pitt! ).